Amino AcidsScitec BCAA 6400 - 375 tabl. 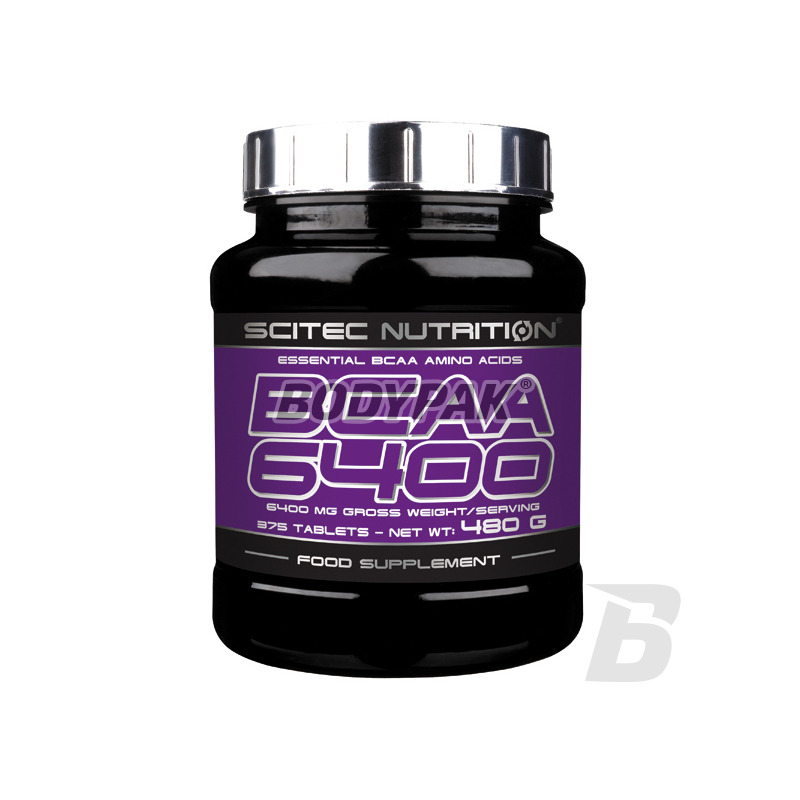 Scitec BCAA 6400 - 375 tabl. The preparation of amino acids of the highest quality. It protects your muscles against catabolism and accelerate their regeneration! Convenient form of tablets. 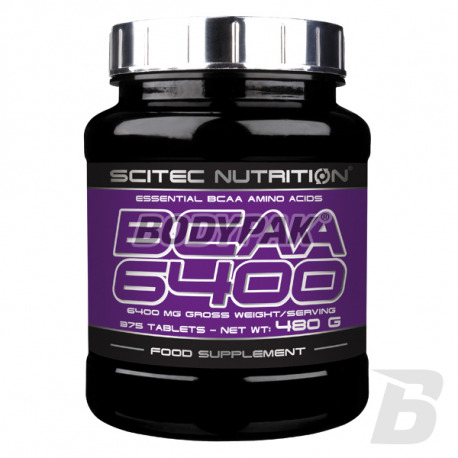 Scitec BCAA 6400 - 125 tabl. Scitec BCAA 6400 - a supplement in his composition appropriately chosen blend of the most important amino acids, branched chain amino acids. They constitute about 25% of the proteins that make up our muscles and it is important in critical moments, such as a period of about training or immediately after waking up, provide a high concentration of BCAA in the body. Branched chain amino acids (BCAA), a group of amino acids which includes leucine, isoleucine and valine. BCAA are nine known. "Necessary" (exogenous) amino acids, which the body can not produce. Their only source is the food and dietary supplements. 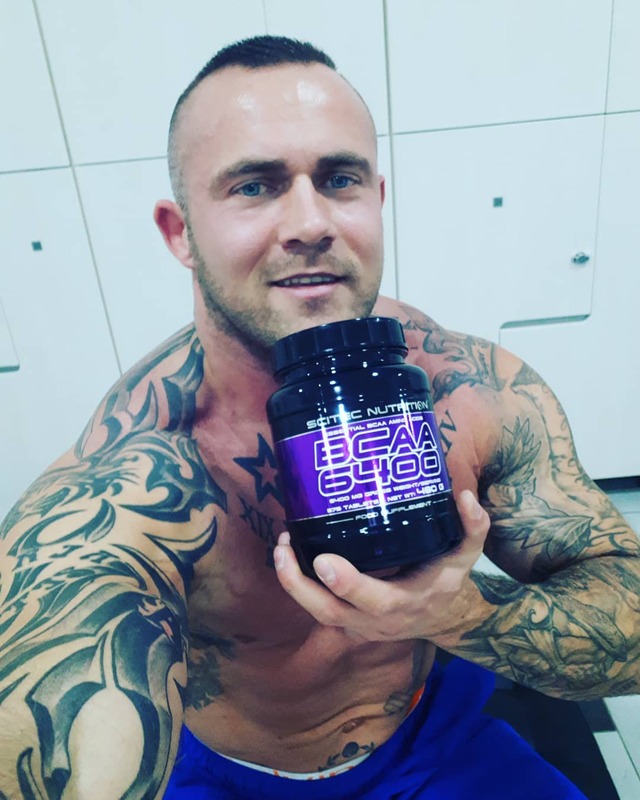 Branched chain amino acids (BCAA) account for about 35% of the amino acids of muscle cells and are essential for the proper functioning of the body. BCAA can be consumed in the form of dietary supplements, especially during training and increased physical activity. Formula BCAA 6400 includes leucine, isoleucine and valine in the ratio of 2: 1: 1 and there is convenient to consume form which is pills! Leucine constituting half of the BCAA 6400 is one of the essential amino acids that belongs to the BCAA. Recent scientific studies show that leucine is an essential amino acid, because it directly stimulates protein synthesis in skeletal muscle - a high amount of leucine in the body is indicative of anabolic state. Leucine helps to regenerate and protects the body from decomposition (anti-catabolic effect). Leucine turns out to be useful when protein intake is high and even when it is used together with the rapidly etched using protein shakes. BCAA's can also be used by the muscles as an energy source during intense training. Scitec jak na razie mnie nie zawiódł i mam nadzieje że tak zostanie. Polecam jako uzupełnienie dziennej diety. Bardzo opłacalne w zakupie aminokwasy. Nie za duże tabletki co przy porcji 4 nie sprawia problemu w połknięciu całości na raz. Skutecznie regeneruje po treningu siłowym oraz w jego trakcie przeciwdziała katabolizmowi - polecam! Tego szukałem, bo proszków już mam dość! Produkt wart jest swojej ceny.